How about you guys? Which color do you prefer? MINNEAPOLIS--(BUSINESS WIRE)--Best Buy Mobile, the mobile specialty retail unit of Best Buy Co. Inc (NYSE: BBY), is proud to announce the exclusive launch availability of HTC EVO 4G from Sprint in white, an eye-catching sibling of the HTC EVO 4G that continues to create buzz in the mobile phone marketplace. "We are proud to help HTC and Sprint bring such a unique, fashionable and versatile mobile phone to consumers. It is a true connectivity device and exclusively launching this product affirms the position Best Buy Mobile has taken as a preferred destination for smartphones." Beginning June 18, Best Buy is taking pre-orders for the white version of the popular mobile device, which is the first 4G smartphone in America. It officially launches in all Best Buy and Best Buy Mobile stores, as well as BestBuy.com/Mobile on July 11. It retails for $199.99 for a new or eligible upgrade with a new two-year agreement on select plan with Premium Data add-on. 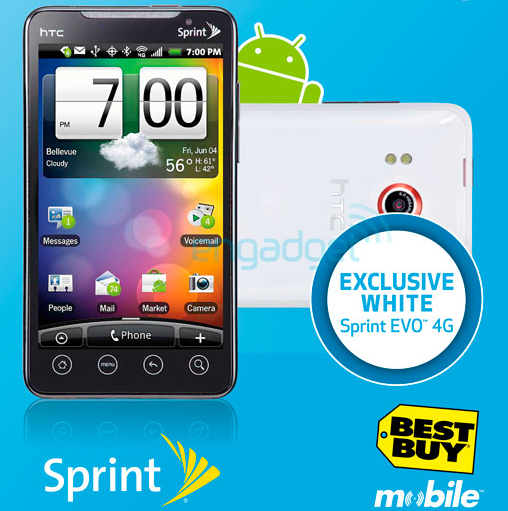 As the only retail and online location to launch HTC EVO 4G from Sprint in white, Best Buy is showcasing a new way to bring smartphones, accessories, applications and other services to market for consumers. 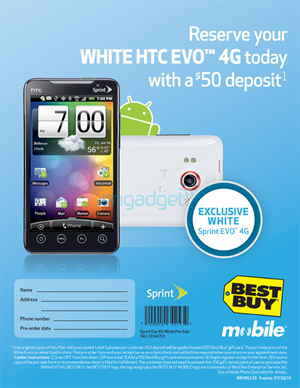 "We know that people turn to Best Buy for the latest consumer electronics, and now with our ability to exclusively debut great smartphones like the white version of HTC EVO 4G, they are turning to us for the best smartphones as well," said Jude Buckley, chief merchant and marketing officer for Best Buy Mobile. "We are proud to help HTC and Sprint bring such a unique, fashionable and versatile mobile phone to consumers. It is a true connectivity device and exclusively launching this product affirms the position Best Buy Mobile has taken as a preferred destination for smartphones." Like the original model, the white version of HTC EVO 4G from Sprint allows consumers to create their own mobile hotspot and share the Sprint 3G or 4G network with up to 8 Wi-Fi enabled devices. Consumers will also get the powerful Android operating system, including access to thousands of great apps. Customers lucky enough to get their hands on the this white-hot smartphone at Best Buy will enjoy the added benefit of no mail-in rebates and can Walk Out Working with access to their email, contacts and favorite content set up by a Best Buy Mobile sales associate.